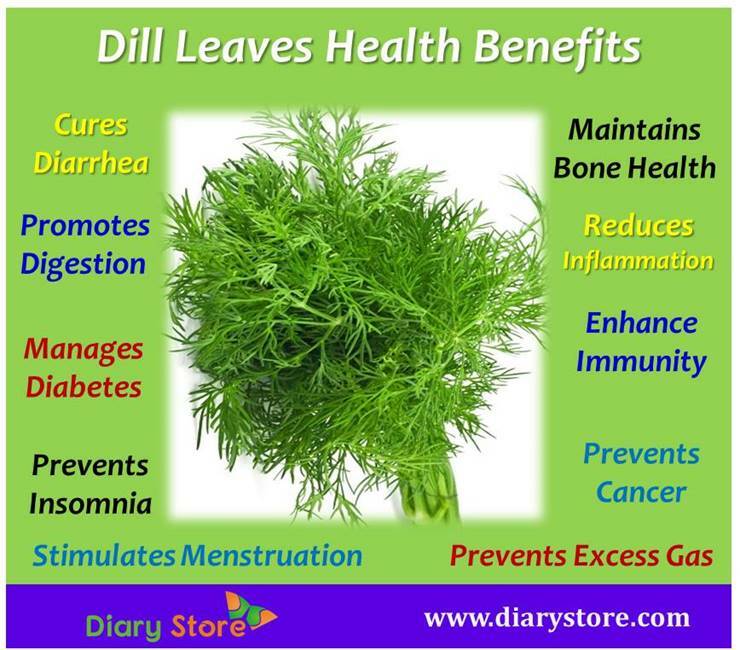 Dill Leaves - Health benefits of Dill include relief from insomnia, respiratory disorders, and improper menstrual cycle. They also prevent cancer, aid in digestion, cure diarrhea, prevent allergies and osteoporosis, excess gas, and manage diabetes. They are also good for boosting immunity system and improving the bone health. Dill is a perennial or annual herb with pleasant anise-like flavor. Dill belongs to the family of Apiaceae, scientifically known as Anethum graveolens. Dill is native to Mediterranean and Eastern-European regions. Its green leaves are wispy and fernlike and have a soft texture with pleasant anise aroma and sweet taste. Dill seeds are light brown in color, oval in shap, aromatic, sweet and citrous, but also slightly bitter. Both its springs (leaves) and seeds are used as food and for medical purpose for hundreds of years. It is used as a herb for different purposes in almost all countries. Primarily dill can be used for making pickles and used dry as a topping for a number of eatables. It is also used to produce soaps, perfumes, detergents, creams and lotions. Fresh dill is available in summer whereas dried dill is available throughout the year. Dill leaves contain good amount of calcium which is essential for strengthening bones and prevents bone loss as well as loss of bone mineral density. Osteoporosis affects millions of people each year, which is a bone disorder that is characterized by the loss of bone mass and weakening of bones. One of the main reasons for occurrence of osteoporosis is lack of calcium. Regular consumption of dill is one way to supplement your body with good amount of calcium, making your bones strong and preventing bone disorders like osteoporosis. Dill is a great appetizer and therefore extensively used in culinary applications. It is used as remedy for digestion. Presence of essential oils in dill stimulates the production of right amount of bile and digestive juices in stomach. The essential oils also stimulate peristaltic motion of the intestine, easing the passage of bowel movements and thus relieving constipation. Insomnia is a sleep disorder that can make it hard to get sleep. It has been constantly affecting millions of people worldwide. The gentle effect of dill leaves may be beneficial for insomnia because it contains essential oils. The essential oils possess the sedative, stimulating and hypnotic properties that help in calming and relaxing the mind. Presence of flavonoids and vitamin-B complex in its essential oils stimulates the production of certain enzymes and hormones that induce a calming and hypnotic effect, thus help you to get a good night’s sleep. Dill leaves have been found to exhibit strong antimicrobial effects. It prevents the number of microbial infections throughout the body. 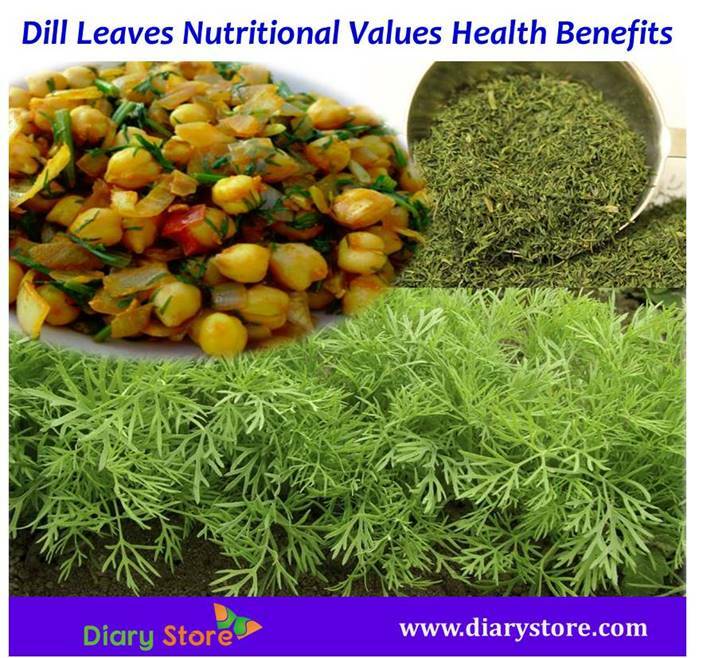 Dill contains good amount of vitamin C, which helps to enhance the immunity system. Strong immunity system helps you protect your body from various infections and diseases. The carminative properties of dill promote expulsion of gases and reduce gas formation in stomach or bowel, so as to relieve flatulence or abdominal pain or distension. Regular consumption of dill may prevent the excess gas. Dill helps in stimulating and regulating the menstrual cycles in women. Presence of flavonoids in the essential oil of dill helps to stimulate the secretion of certain hormones which maintain proper menstrual cycles in women. Microbial infections and indigestion are main reasons to occurrence of diarrhea. The essential oils in dill are germicidal or bactericidal in nature, which help in inhibiting the microbial infections, thereby curing diarrhea. Dill is often recommended as one of the best foods for people with type 1 diabetes because it is a great herb to control the blood sugar levels and mange diabetes. Dill can help to decrease the fluctuations of serum lipids and insulin levels in corticosteroid-induced diabetes. Dill is known as an anti-inflammatory herb. It helps in reducing inflammation and allergies. Presence of monoterpenes and flavonoids in this herb help in fighting allergies. Dill seed oil is helpful to reduce the inflammation, allergies and respiratory infections. Its oil is recommended for people suffering from inflammation in the throat and mouth. Flavonoids and monoterpenes are present in dill. Flavonoids act like antioxidants that are helpful in fighting off free radicals and preventing cancer. Monoterpenes activate the secretion of an enzyme known as glutathione-S-transferase which is very effective in neutralizing carcinogens. It can also help in neutralizing Cyano- and Benzo- derivatives and free radicals, thereby protecting the body from cancer.